This is the contemporary classic style also called “Coldwell-Banker” swing post design with the curved top. A popular discount price real estate post that is also called the classic post. Stock always on hand. This is the traditional cross-arm swing post style, sometimes called “Colonial” swing post. No longer in stock. 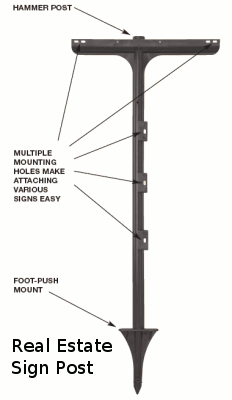 The above Swing Post sign holders are a high quality sign bracket made from 1″ square tube. These unit is a breakdown two piece design to allow for easy transport. The top section detaches from the base with a quick release button. These unit will also accommodate riders. We have placed special threaded inserts that allow a standard rider to be attached to the cross arm. The rider panels are held in by thumbscrews. The inserts are recessed so there are no awkward studs sticking up to snag and scratch other items during transport. This is a quality made real estate sign post. The main sign panel attached to the post by means of special “U” clips that snap into the frame. We pack 5 units to a carton for UPS shipping. Our special designed shipping cartons securely hold the frames and tops in place during transit. Cost per each. Order in multiples of 5. Order 25 or more and get a discount per swing post. 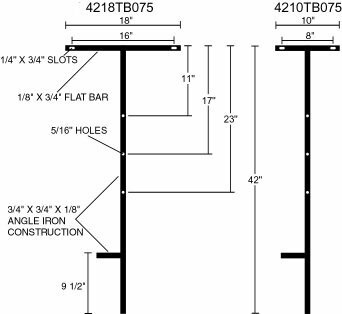 Two options for the same great T bar stake: 42″ tall with either a 10″ cross bar or an 18″ cross bar. Made with 3/4″ angle iron construction. Three holes on vertical and two holes on 3/4″ flat top bar for sign mounting. Notch at top of stake protects flute wires from bending. Black powder coat finish. Order in multiples of 12 pieces. The “T” bar stakes is one of the most popular stakes in the market today. We use 3/4″ angle for the shaft and foot push. The strap at the top is 1/8″ x 3/4″ flat strip, 17.5″ long. The kick-bar is welded, and the T strap is welded on to the shaft (no flimsy rivets). The shaft has a series of slots that run the length of the shaft to accommodate many panel sizes. These are boxed 12/carton for UPS shipments. Choose between 42″ and 48″ tall. The “Wishbone” stake is unique in that the stake will accommodate almost any panel size. The shaft is made from two 3/8″ rod bars running parallel to each other. Simply bolt your panel to the top strap and then run your nut/bolt between the bars/sign panel and tighten – no holes to try and match up with! These stakes are made from 3/8″ round rod with a 3/4″ wide steel strap welded to the top. The top strap is 17.5″ long. 42″ tall. Shipped in quantities of 12 for Wishbone Stakes. The workhorse of the sign industry, these angle stakes a staple for any sign store. These stakes are made from strong 3/4″ angle with a double welded foot-push. There is a series of slots punched into the shaft for panel attachment. Packed 12/carton for UPS shipping. Choose among 3′, 4′, and 5′ tall. These lightweight security stakes are made of Galvinized Steel for years of use. The stakes are formed into a channel shape that is 1/2 x 1/2 x 1/2, with the face being 1/2″. The stakes come in sizes 30″ and 36″ tall, and are boxed in multiples of 12. Minimum order is 100 stakes. Please note: 36″ stakes are custom made. These are ideal for security firms or anywhere you need a small sign to put around the house or building. The stakes have two holes drilled into the face for use with self tapping screws. Double sided tape can also be used. The ends are mitered for ground insertion. Cost per each. Order in multiples of 12 or 50 bulk pack. Wishbone Stakes shipped in multiples of 12. Plastic Tough-Stakes shipped in multiples of 10. Call for larger quantity discounts of 50 or more, we will cut you a deal. Call us on a slow day, we will give discounts to get you motivated to get your check book out. 33 inches tall, made from heavy duty 3/4 angle iron. Realtor Sign Posts Very strong, pound into the ground with sledge hammer and long lasting as steel.